Here's a little sneaky peek! This Workshop is the place where you will learn to create fabulous unique journals the 'Art Eye Candy' way. 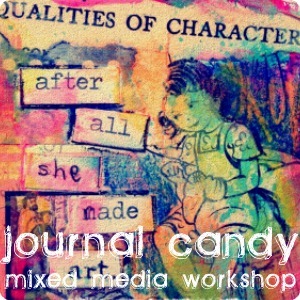 In Journal Candy we will explore using mixed media techniques to create magical journal pages, make handmade journals, work in altered books and board books and learn how to create a mini zine. 20 Inspiration Candy videos to get your ideas flowing. Membership to an exclusive facebook group just for workshop students.